Forza Motorsport 7 is one of Microsoft’s biggest releases of 2017. The series rarely fails to impress and this year’s is no exception. If you were looking for some quick hits on why you should play it, look no further. If you want the largest collection of licensed vehicles in a racing game, then you want to be playing Forza 7. The tally for this year’s game is over 700, and it’s not just cars, either. Racing trucks, buggies, special Forza Editions all join the lineup of the real-life road and race cars that never leaves a dull race. And if you’re really brave, why not collect them all?! Forza 7 doesn’t just have some of the best race tracks in the world, scanned and recreated meticulously in the digital world. It also has some that the developers have created themselves. Take Rio, for example. It’s based on real-world locations, but the circuit itself doesn’t exist. But that doesn’t mean it’s not both spectacular and a stunning setting. And many tracks have multiple layouts, so there are lots to take on. Forza 7 is one of the flagship titles to show off the capabilities of the forthcoming Xbox One X. It’ll be patched for a day-one experience that not only delivers 4K gaming but also improved textures. And we’re told it still plays at 60 FPS. Mouthwatering. Xbox Play Anywhere is a truly remarkable program from Microsoft that allows supported games to be bought once and played across Xbox One and Windows 10 PCs. Not only that, thanks to Xbox Live your saves will transfer across, too, so you can always pick up where you left, whichever you choose to play on. 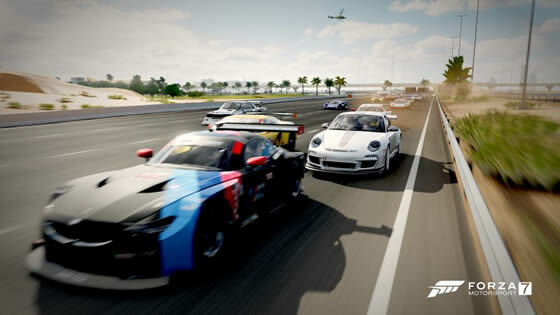 The single-player mode is now called the Forza Drivers Cup and is a little more involved than previous years. You’ll get points now for winning races. Races mean championships and with that comes your progression through the game. In true Forza style, in each section of the Forza Drivers Cup, there is a whole range of championships and showcase events to win in all kinds of different cars. It wouldn’t be Forza without an opportunity to show off your skills against your friends, family and the world at large. Forza’s multiplayer hoppers contain something for everyone. It’s not just a case of jump in and off you go. There are different types of races for various vehicles and abilities to ensure that everyone has a good time. Novice or a seasoned pro. On both Xbox One and Windows 10, Forza 7 supports a host of racing wheels and pedals for that ultimate experience. The selection on PC is a little broader, but if you have an Xbox One certified wheel, you can use it in Forza 7. Just plug it in and off you go.